This plugin spotlight features Decimort 2, an impressive high-quality bitcrusher developed by D16 Group that offers the coloration and warmth characteristic of circuits from classic samplers. 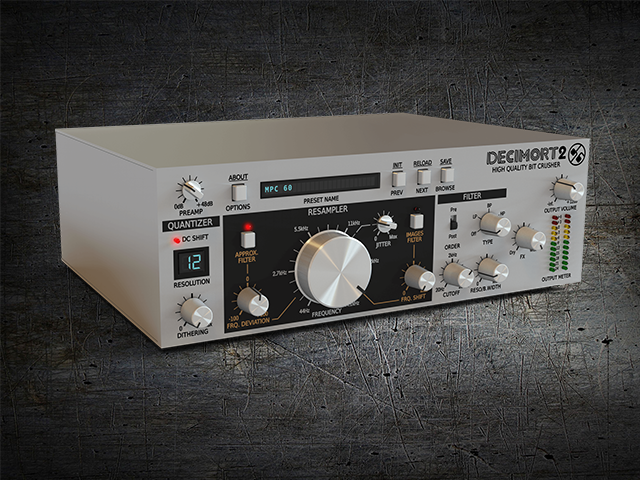 At its core, D16′s Decimort 2 effect unit is an impressive bitcrusher and sample rate reducer that sports some highly unconventional features. The advanced signal processing algorithms within Decimort are geared to simulate those sought after “grit” and “color” characteristics of vintage hardware samplers. Decimort 2 recreates this musical coloration and adds that vintage sampler magic back to any imaginable sound you run through it. 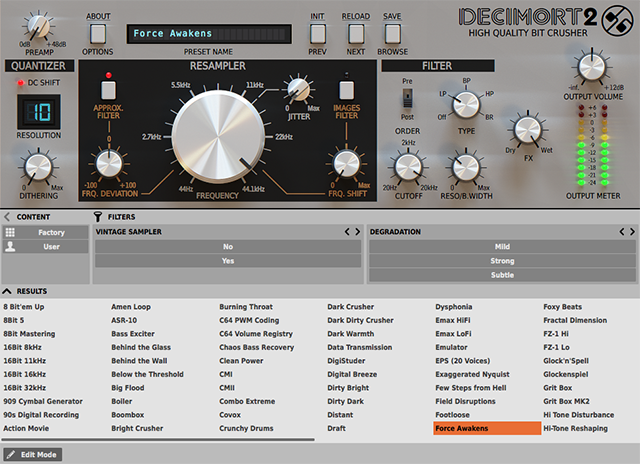 That’s not all; Decimort 2 also extends its capabilities beyond vintage sampler emulation. This full featured unit brings a new level of control not commonly found on other bitcrushing plugins giving you even more sound shaping possibilities. For an affordable price, you can easily create a low-fidelity “fat” sound that sits well in the mix. Two optional anti-alias filters: The Approximative Filter gives you the option to control the amount of aliasing that occurs at the output. The filter features a very steep low-pass pre-filter coupled with the resampling frequency that removes all harmonic content above the set frequency, ensuring no aliasing will appear below that frequency. The Image Filter is another post filtering option that is also synchronized with the Resampler section of controls. It is used to give you control over the amount of aliasing images appearing above the resampling frequency when enabled. Adjustable Jitter: This uncommon feature introduces short-period, random fluctuations to the resampling frequency which produces a type of harmonic distortion that is often different and interesting. Quantization methods: Decimort also sports a Quantizer module used to control the signal’s amplitude quantization. Basically, you choose between a set of algorithms each with drastically different dynamics responses to enhance your sounds even further. Controllable dithering: D16 added a dithering option to reduce unpleasant harmonic distortion that occurs when degrading the signal’s amplitude. It essentially reduces audible quantization errors by masking the harmonic distortions they cause. 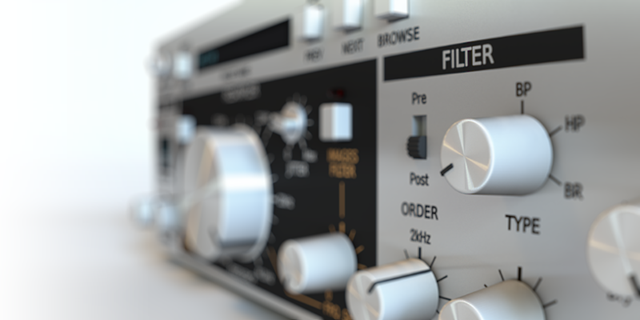 Two in one: Decimort is also equipped with four analog-like filters that have an adjustable resonance to allow further sculpting of the signal. These can be used to smooth the sound or remove sonic artifacts introduced into the signal path. Like all D16 products, I was thoroughly impressed with Decimort 2. The intuitive and easy to understand interface allows you to jump in and get amazing results right away without having to figure out complex controls and options. If you’re familiar with other stellar D16 products like Devastator and Toraverb, then you will feel right at home with Decimort’s design. The sound quality and bitcrushing detail is absolutely amazing! This plugin is arguably one of the best vintage bitcrushing emulations I’ve had the pleasure to try. Not only is Decimort capable of mangling your sounds into creative new directions, but it also comes equipped with unmatched control and sound shaping possibilities. I quickly got started by loading up Decimort on a drum loop and began flipping through a wide variety of presets to hear how it transformed the sound. Once I settled on a preset, I then tweaked all the different controls to hear how they altered the sound further, at times pushing it to extremes to hear just how wild I could make the drum loop sound. In the end, I now have a new go-to tool for giving my sounds that famous “lo-fi” touch that works great for any genre of music. Decimort is truly a powerful and musical effect that will make a fine addition to your arsenal. In addition, it gives you the ability to emulate classic sampling units in-the-box with even greater precision at an affordable price. Decimort 2 is available to download at D16 Group and authorized dealers.